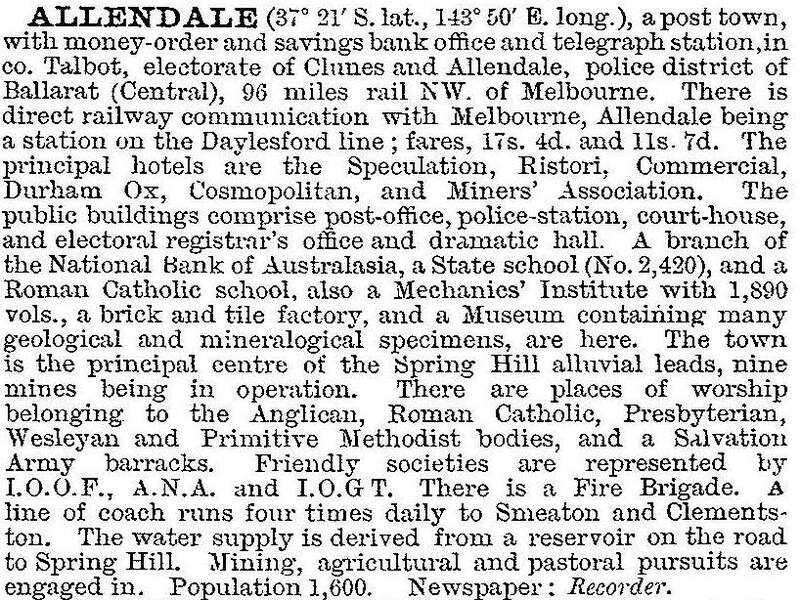 Allendale, a former mining town, has shrunk to a village which is 7 km north-east of Creswick and 105 km north-west of Melbourne. A town street network of about ten blocks is visible, with a scattering of buildings. It is thought that it was named after a village in Northumberland, England. During 1910-20 mining ended and the remaining farming population supported just two hotels in 1921. A new general store was built, however, when an earlier one was burnt down in 1933. Apart from that building and the former school, post office and bakery, Allendale is mostly a scattering of timber houses and cottages. A reserve and a training track are just outside the old town. Numerous mullock heaps are around Allendale, but there is an avenue of trees.